This posting is in the danger of being written too long, but I think it is necessary to close this year with this topic, simply because it looks at the future. The word “Islamic Fintech” has been buzzing for quite some time now and there have been pockets of excitement on what it should mean. Many financial institutions have jumped onto the bandwagon declaring they are also part of this new wave of what a bank could offer. While all these are still early stages of development, I do notice a lot of effort is built into “digitalisation” and “apps-based application” and “efficiently and convenience” of EXISTING banking processes and relationships. These enhancements are still driven by financial institutions and centred around improving traditional processes for banking services, or short-circuiting the credit processing elements of financing. Although enhancements via technology is an important aspect, these should not be defined as “fintech”. There is an element of fintech in process improvements, but PROCESS IMPROVEMENT itself are not fintech. Traditionally, banks always hold the impression that “People need Banks, one way or another”. It is this understanding that the bank can continue investing into their brick and mortar business model, with customers always coming to them when they need capital, financing funds or products and services. The competition is that who can deliver existing products in the most efficient manner, with technology as the enabler. Money is spent to improve accessibility to the bank’s EXISTING products, services and proposition. 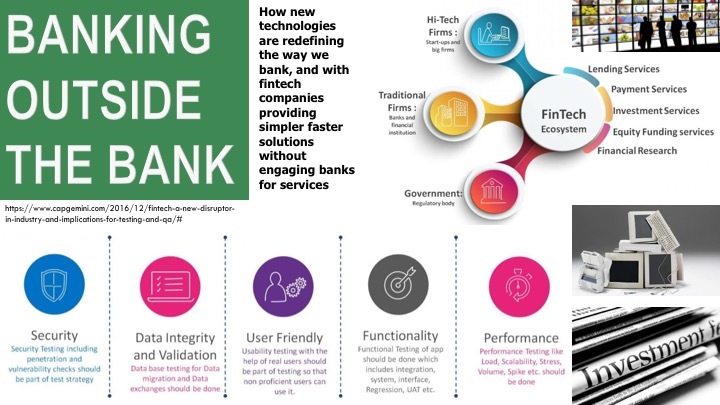 In improving processes, banks just needs to concentrate on all the products and services offered and build the corresponding infrastructure to ensure efficient delivery with technology. It can be “Apps-driven” based on inquiry or transaction-based, with new features attached to existing products. It is just creation of new delivery channels which will deliver existing products to customers faster than before. But that in my view is NOT what fintech is all about. IF FINTECH IS NOT PROCESS IMPROVEMENTS THEN WHAT IS IT? While “Process Enhancement” can help support the “New Processes” element, but I think it falls short of the idea for fintech i.e to re-think the business model of financial services. The idea of fintech should be this: Understanding what the requirements of the Gen Y customers are and how they work, develop the products and services on platforms that they are most familiar with, and the proposition that the bank can offer on their chosen platform. It is a total re-think of delivering products and propositions to the up-coming Gen Y potential customers. As much as banks and financial institutions like to believe the financial wallet cannot exist outside the regulated financial system, the evidence is slowly being presented as otherwise. Companies are finding ways to survive, live and thrive outside the banking system with facilities and opportunities in the New Economy, slowly eroding the traditional banks’ share of financial wallet. Big Data companies have proven that their database is far more powerful (and valuable) than the database an individual bank would have on its existing customers. Bitcoin and other cryptocurrencies goes through thousands of transactions within blockchain and is only realised into banks network when actual physical cash is needed. eWallet lets value resides in tech platforms for purchasing and sales of goods and services (more like barter or exchange of goods and services), and up to a certain extent provides microfinancing. Prepaid and loaded value arrangement provides free seed funding and capital for businesses, without the cost of borrowing incurred via banks. Peer to Peer (P2P) arrangement links crowdfund Investors to Entrepreneur without complicated documentation with speed and transparency levels never seen before. Sharing of risks and profits (including potential pay-offs) are now more understood as compared to traditional financing arrangements. Mudharabah, Musyarakah, and Ijarah may now have a place in an economy where equity participation is expected and sought after. Technology can now provide a single-point possibility of all our needs; goods, services, food, shopping, bills payment, money transfers, investments, borrowing, deliveries, medical, transport, social interaction, travel, holidays, education, careers development, information and even branding. Financial services can be integrated into all these elements, now driven via apps. But for this new infrastructure, the various “relationships” are needed to be identified and re-looked and re-engineered. With the proper Shariah compliance consideration. This “single point” proposition is where tech companies play a crucial part. Rethinking the financial model must happen with the involvement of tech companies due to the advantage of everything being on the internet (internet of things). There are still a lot of limitations to what a bank can do, understandably due to financial regulations. The space of where banks are continuously competing (or evolving) is the “FINANCIAL SOLUTIONS” box above, and maybe payment gateways linked to service providers. But tech-companies? The revolution of technologies move so quickly that regulations will continue to struggle to catch up. 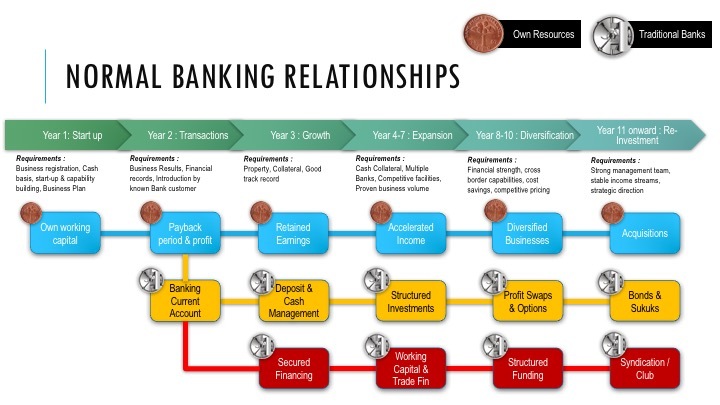 In the diagram above, I attempt to identify some of the areas of traditional banking where fintech can come in and provide a like-for-like solution or even fully replace the proposition by traditional banks. Certainly a lot of the consumer touch-points can be easily replicated in a technology platform, and crowdfunding and crowdsourcing can replace traditional financing and working capital requirements as well. 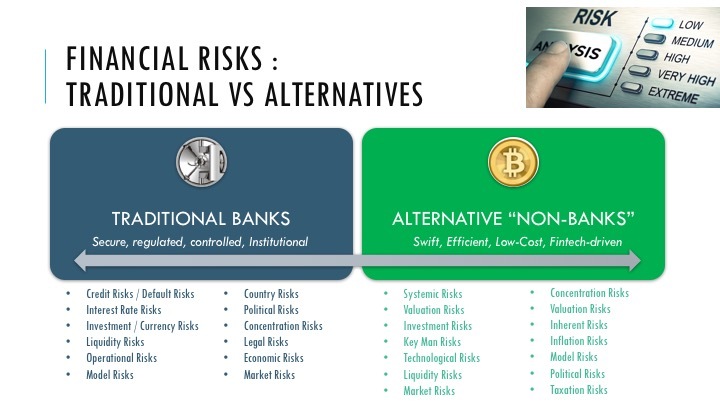 Some services are still embedded into a banking structure (such as Current Accounts or Treasury product propositions) but over time, such products may be linked to fintech and the banks may eventually become ancillary service providers rather than main bank, earning just fees for services provided. The landscape of what a bank offers will ultimately change in the next few years, when consumers no longer go to banks for financing, services, remittance and settlement of business transactions. As the new generation grows up with tech and becomes financially affluent, their expectation of how a banking experience should be will also dictate the model a bank adopts. 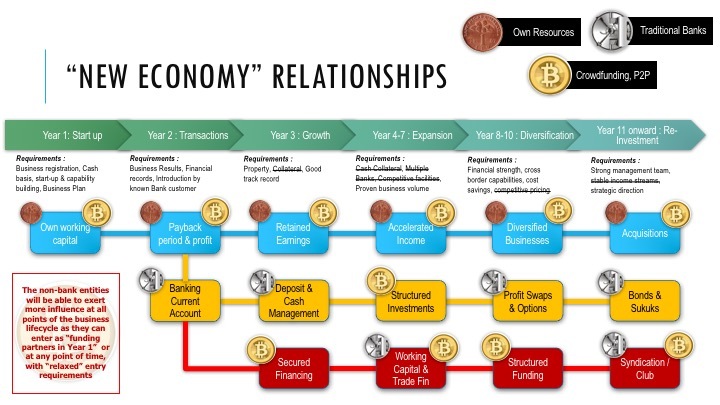 So where do I see the banking industry in the next 5 years? Personally, I think a “price-comparison platform” will emerge, as seen nowadays in the travel/hotel/tourism industry. Information from all the financial service providers are flowed into a single platform, and consumers are able to immediately compare products, services and prices on a single platform and choose their solutions. Instead of customers subscribing to multiple banks offering different products and services (at different pricing), they only need to subscribe to a single platform where all information on the products are available to select. This is where the promise of fintech can thrive; accuracy of information, convenience of access, and speed of transaction. It is a matter of time the various industries converge. We may think regulatory pressure will halt some of the progress but mostly it have been reactive regulations. And the challenge is that these developments are driven by tech companies which has no loyalties to banking regulations as their scope of business cuts across various industries. It will be a period of “non-regulated” until the market starts to recognise the need to regulate and managing the risks. A regulatory sandbox will be usefull, but if the “New Economy” moves faster than the speed where regulations are being formalised, there will be a lot of speculative and arbitrage opportunities for the market to gain. This also means the New Economy brings new risks that the consumers are not aware off. While the banks have been fine-tuning its risks that it takes over the past half-century or so, the fintech companies may not see the elements of risks other than technology risks or systemic risks. Almost all the risks faced by banks are also prevalent in fintech companies or non-banks, plus the specific risks by fintech companies. They might be great at integration of technology, but banks are still masters when it comes to understanding financial risks. As I mentioned, banks understand risks better than a tech company. A tech company understand speed, efficiency and channels better than any banks can have. At the moment, banks are developing “fintech” on their own which is mostly a process improvement project. Tech companies are developing “banking services” on their own as well, where it linked investor’s money and economic entrepreneurs via technology. The question is really, “why not a bank consume or enter into a partnership with tech companies to provide a solution beyond traditional banking?” We have started to see this trend where banks attempt to purchase outright a tech company and use the company as an incubator for new products and services. It should look into having a different operating structure which encourages new ideas, innovation, internet-based solutions, as well as delivering to a larger segment of consumers (including the Unbanked segment). The end-result might not look like what we recognise as banks we see today. This could be a separate line of business for banks, where the element of technology integrated into the wider economy is more dominant than its traditional banking products and services. 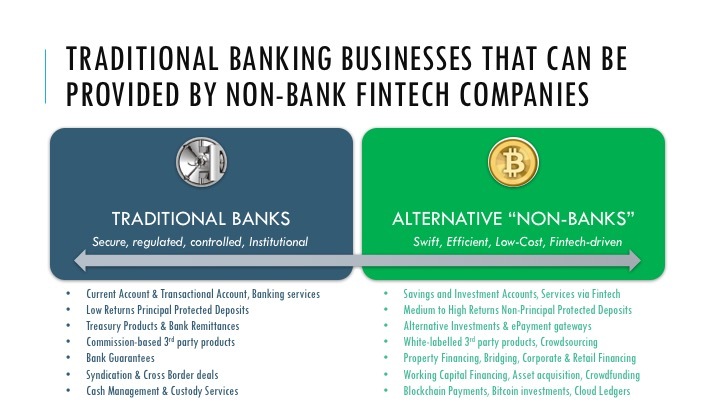 You could have Bank A offering the traditional products and services, and Bank A-Tech offering fintech solutions to a new generation. The same bank catering to 2 business lines, employing different delivery channels. But breaking away from such traditional infrastructure may take time, and the greatest fear is that the market cannot wait. Fintech companies may be able to offer similar proposition in half the time required, and this will not motivate fintech companies to join-venture with a financial institution. In an environment where new opportunities arise at the blink of an eye and regulations have yet to be formalised, the temptation to go on its own will drive innovation by the fintech companies, leaving behind banks. Fintech companies have the capability to look at consumer needs and develop the solutions from the bottom, and flow the linkages to the top. Connect the dots where the solutions provider are linked together in a platform. 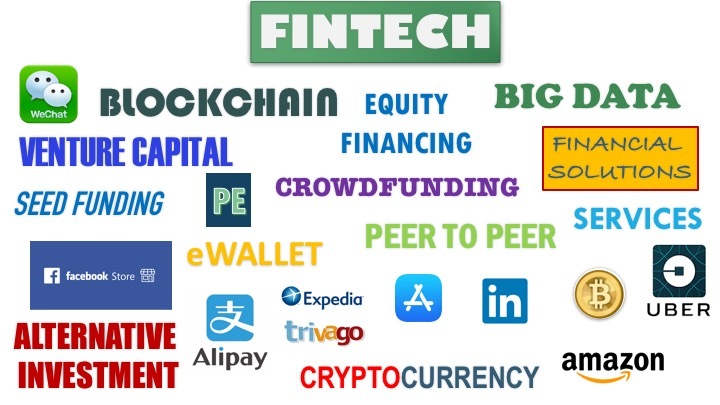 Will fintech companies be the next driver in providing financial solution? I know my answer to that question. It is perhaps just a matter of time where future banking is done outside of a bank. Perhaps the model of banking needs to be re-imagined. Wishing all my readers a Happy New Year in 2018. I appreciate the support I have received so far. But the new world beckons and hopefully we can do enough to ensure the continuation of the banking industry. I hope Islamic Banking can play a bigger role in taking the industry into this exciting online generation.